Who invented the Hot Dog? The name of the person credited with inventing the Hot Dog is Charles Feltman (1841 - 1910). Charles Feltman is not only famous as the German-American inventor of the Hot Dog but also as a businessman and entrepreneur. When was the Hot Dog invented? Charles Feltman invented the Hot Dog in 1867 at Coney Island, New York during the Second US Industrial Revolution / Victorian period of invention (1850 - 1914). Definition of the Hot Dog: The Hot Dog is defined as a hot dog is a cooked sausage of pork, beef, chicken, traditionally grilled or steamed and served in a sliced, long soft bun as a sandwich and served with condiments such as mustard. Fact 1: Who invented the Hot Dog? The Hot Dog was invented by Charles Feltman in 1867 during the Second US Industrial Revolution era of inventions (1850 - 1914). Fact 2: Who invented the Hot Dog? Prior to the invention of the Hot Dog in 1867, a favorite fast food was the sandwich which had been invented by John Montagu, the 4th Earl of Sandwich in 1762. Pastries and pies were other types of convenient snacks that provided the opportunity to 'eat on the go' - but were nearly always served cold. Fact 3: Who invented the Hot Dog? The hamburger, invented by Charlie Nagreen, did not appear until 1885. An Italian called Raffaele Esposito invented the modern Pizza in 1889. Fact 4: Who invented the Hot Dog? The hot dog became popular as a fast, tasty snack as the culinary needs of America changed during the Industrial Revolution (1850 - 1914) when people moved to the industrialized cities and created a demand for affordable food that could be consumed outside of the home. Fact 5: Who invented the Hot Dog? The origin of the hot dog is a subject of fierce debate but it is believed that the frankfurter that often served as the sausage in a hot dog originated in the city of Frankfurt in Germany in 1487, five years before Christopher Columbus set sail for the new world. Fact 6: Who invented the Hot Dog? There is no dispute that a great variety of sausages were brought from Europe by immigrants to America. One such immigrant was a German called Charles Feltman who emigrated to America in 1856. 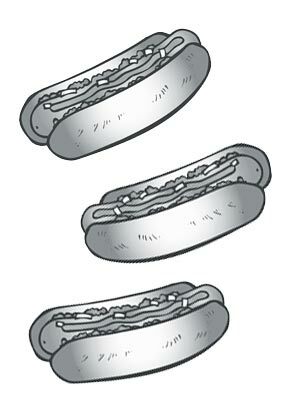 Fact 7: Who invented the Hot Dog? The inventor of the Hot Dog, Charles Feltman, was born on November 8, 1841 in Hanover, Germany and died on September 20, 1910 in Brooklyn, New York. Fact 8: Who invented the Hot Dog? The early years of Charles Feltman were spent in Hanover, Germany where he was raised by his family. Charles Feltman received a basic education and did not undertake higher education. Fact 9: Who invented the Hot Dog? Following his education his first job was as a baker and pie maker in the family business. At the age of 15 Charles Feltman immigrated to America and made his home in New York. Fact 10: Who invented the Hot Dog? In 1829 a bridge and road had been built connecting Coney Island to the mainland, a ferry made it even more accessible and people began taking vacations there, away from the city. In 1868 a resort was built and a railway was added in 1878 making Coney Island a favorite destination for holiday makers who enjoyed a trip to the beaches. Fact 11: Who invented the Hot Dog? Charles Feltman saw the potential of the tourist trade and in 1867 started selling pies from a pushcart to beachgoers. Competition for selling food increased and Feltman's pie business began to suffer. He decided to stop selling pies and to specialize in just one hot sandwich (his little cart was too small to carry a large variety of foods and cooking equipment). Fact 12: Who invented the Hot Dog? Charles Feltman designed his hot sandwich using a frankfurter, a type of smoked-beef-and-pork sausage, topped with the traditional German toppings of sauerkraut and mustard which he served in a roll. Fact 13: Who invented the Hot Dog? Charles Feltman was convinced his customers would enjoy his hot, convenient food and installed a small charcoal stove in his pushcart enabling him to boil his sausages in a kettle. He called his sausage on a split roll 'frankfurter sandwiches'. Fact 14: Who invented the Hot Dog? The hot 'frankfurter sandwiches' were a great success and Feltman reportedly sold 3,684 frankfurter sandwiches during his first year in business. Fact 15: Who invented the Hot Dog? Charles Feltman ditched his pushcart and opened up the first Coney Island hot dog stand on a 200 by 150 foot plot. He went on to extend the plot to 1,200 feet and opened his own restaurant called Feltman's German Beer Garden. Fact 16: Who invented the Hot Dog? The origin of the name 'Hot Dog' is obscure but the famous German dachshund has a long, curved body that resembled the shape of a sausage - hence the name 'Hot Dog'. The sausages were called a variety of names including frankfurters, red hots, weiners and dachshund sausages but the short, simple name of Hot Dog stuck. Fact 18: Who invented the Hot Dog? The success of the restaurant enabled Charles Feltman to build a mini-empire with a hotel, restaurants, food stands, beer gardens, bars and amusements. Fact 19: Who invented the Hot Dog? Charles Feltman died on September 20, 1910 in Brooklyn New York. His sons Charles L. Feltman and Alfred F. Feltman and grandson Charles A. Feltman continued the business until the 1950's - all made possible by the invention of the Hot Dog.